Bringing a fleet of yachts to an immersive multi-touch experience. When confronted with logistical limitations of bringing over 30 yachts to a showroom floor and the challenge of maximizing ROI at a major trade show, Horizon Yachts turned to SpinTouch to stand out and turn visitors into buyers. 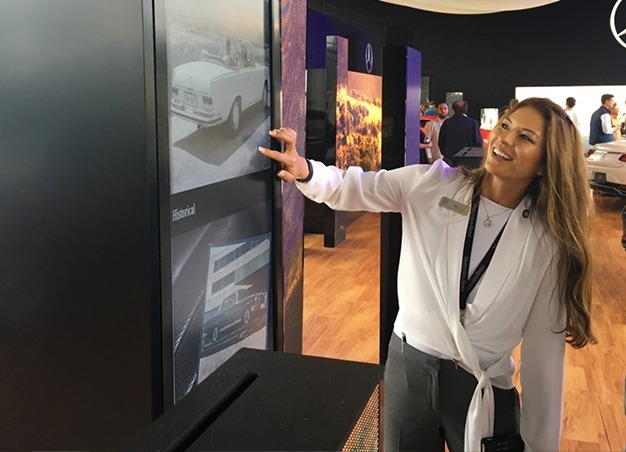 Beyond developing an integrated system of displays and tablets, SpinTouch delivered immersive experiences for prospects and an agile sales platform for Horizon Yachts’ salespeople. This approach became critical to personalize demos for each visitor with precision and speed. The annual Fort Lauderdale International Boat Show (FLIBS) is an opportunity for yacht, boat, and marine product companies to showcase their models in front of their target audience. By gathering a crowd with nautical interests, FLIBS attracts over 1,000 of the world’s yacht builders contending for the audience’s interest. 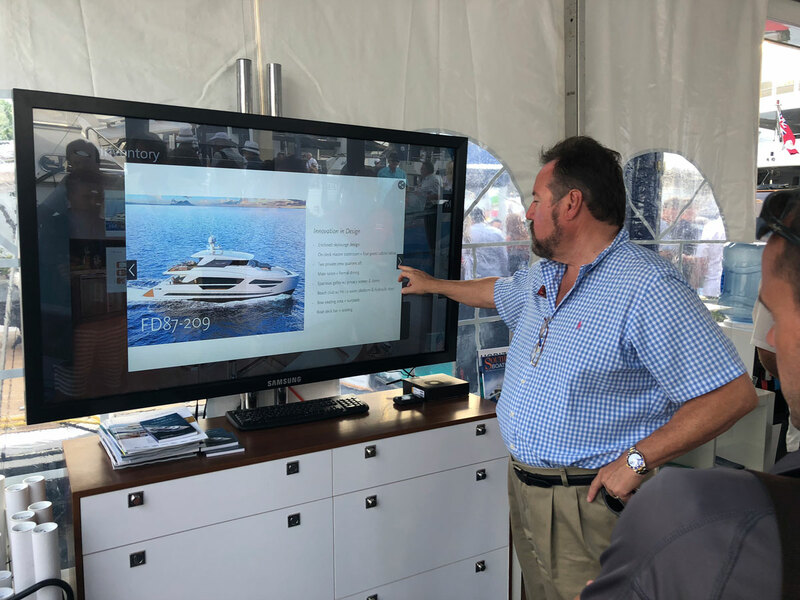 To maximize their exposure to an engaged audience gathered at FLIBS, Horizon Yachts needed a presentation solution that would highlight their yacht customization capabilities, engineering prowess, design competencies, and dedication to their customers. This was integral considering it was logistically impossible to bring their entire product line of yachts to the showroom floor. Additionally, Horizon Yachts wanted to deliver a personalized conference platform for each of their visitors in order to demonstrate their company ethos of catering to a customers’ every request. The visitor’s participation is also crucially important to Horizon Yachts, given that their market is comprised of high net-worth individuals who hold tremendous standards for their product experience. For us, follow-ups and great client experiences are critically important. With SpinTouch’s myShowcase, we were able to capture the contact information of intrigued prospects and accurately retain the specific yacht model of their interest, allowing our follow-ups to be precisely tailored and more focused to their needs. Horizon Yachts partnered with SpinTouch to deliver visceral and customized experiences for each visitor and increase their sales efficiency. To achieve this goal, SpinTouch provided the myShowcase application on a large interactive screen with companion tablets that could support multi-touch interactions. 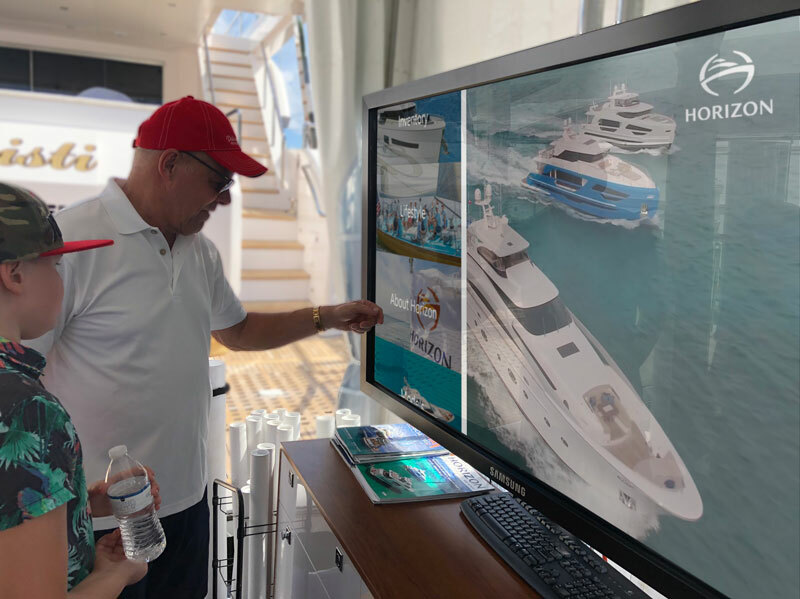 Additionally, this integrated system allowed Horizon Yachts to capture the contact information and the specific content of each visitor’s interest to allow for targeted follow-ups. Horizon Yachts’ salespeople have historically relied on a few onsite yachts to engage with prospective buyers. 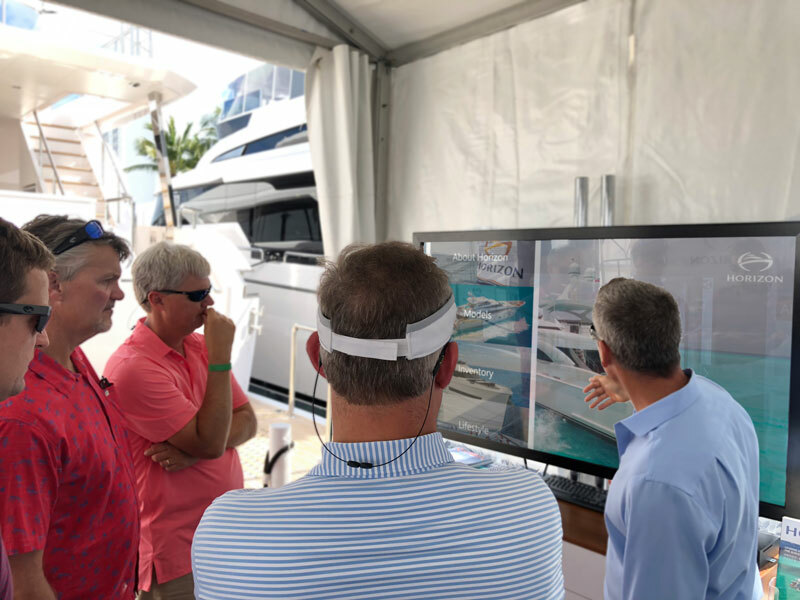 With interactive displays, salespeople can help prospects to not only visualize their future yacht but to also immerse them in a comparative experience. Instead of imagining a customized yacht based on verbal descriptions and static visuals, prospects can interact with Horizon Yachts’ existing 3D models and practically touch the contours of a yacht that could potentially be theirs. Prior to utilizing SpinTouch technology, Horizon Yachts tried to drive sales with high-quality brochures. However, the return on investment is difficult to track for physical collaterals, and brochures are often lost during travel. 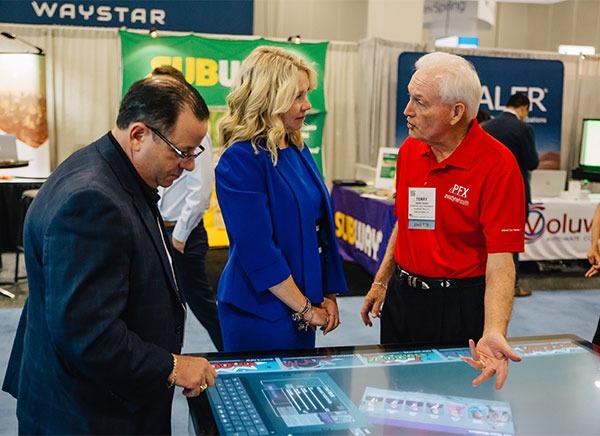 Thus, in addition to the interactive displays, SpinTouch also provided an in-platform lead capture feature that allowed salespeople and authorized brokers to not only make an impression on prospects but also maintain an ongoing conversation. With these new capabilities, Horizon Yachts has provided salespeople and their authorized brokers with the ultimate flexibility to cruise the entire portfolio of luxury yachts (conceptual or otherwise) to deliver customized experiences at scale. 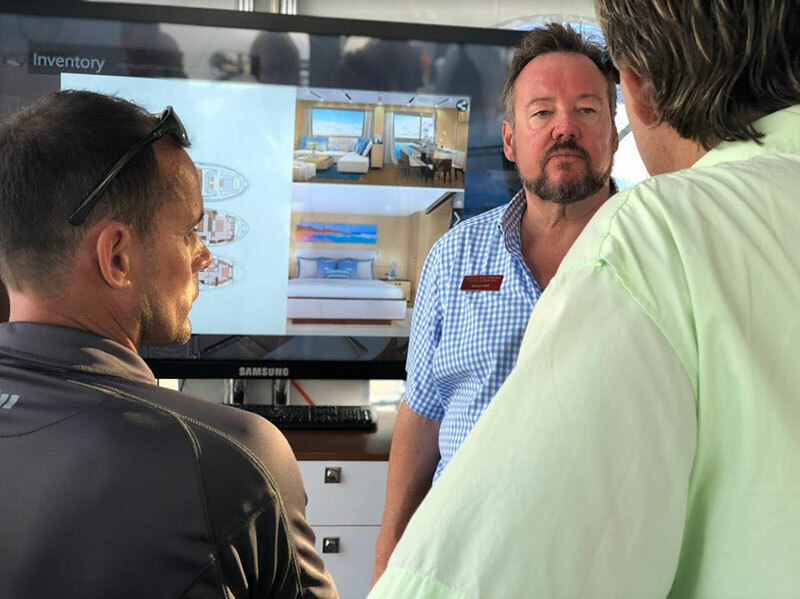 By overcoming the implausible logistics of bringing their entire line of luxury yachts to the showroom floor, Horizon Yachts was able to show and not simply tell prospects about their products, expertise, and dedication to the customer experience. Horizon Yachts is an award-winning luxury yacht builder that specializes in crafting custom boats with attention to hydrodynamic functionality, safety, and design. Having delivered over 780 boats across eight models in their fleet, Horizon Yachts has emerged as a leading Asian brand in the luxury boat industry.